I’m a student of Chicago history and have been ever since I started reading Mike Royko’s columns in the Chicago Daily News (RIP) and discovered Ben Hecht and Charles MacArthur’s play Front Page. I learned more in a Chicago history course at Steinmetz High School and a lot more in docent training from the Chicago Architecture Foundation. I’ve been collecting books and anecdotes about my favorite city ever since. When John Hodgman said that Chicago is a fictional city like Brigadoon, I knew this had to be added to my library. Bill Savage and Paul Durica obliged with another Chicago yarn. John Hodgman, the Daily Show resident expert and occasional “deranged millionaire,” was in Chicago recently for the Just for Laughs Festival. The Chicagoist interviewed him and he made an astounding statement, which we Chicago lovers must not forget. Hodgman had predicted the end of civilization and possibly the end of the world on December 21, 2012, in accord with the Mayan prediction. So he swallowed and walked that back a bit. Here are some snippets from the Chicagoist interview by Samantha Abernethy. C: Are you concerned that the world could end before you appear in Chicago next week? JOHN HODGMAN: No, but what I’m saying is that another one of my prophecies that came true is that Chicago became, Chicago emerged from the swamp next to the lake and became real. Because as you know I, John Hodgman, have always maintained Chicago is a fable, a fictional city like Brigadoon. C: And why is that? JOHN HODGMAN: Well you know, for those of us in New York, we would meet these travelers who had come to New York, and they would tell these stories about this amazing utopia called Chicago where rents were still reasonable and newspapers still thrived, and old-time bars still served boilermakers and the rivers were green with beer. I was like, “I’m sorry but you’re insane. There is no such place. If there were, why did you leave it?” And that’s how I came to believe that there was a mythical city called Chicago, a legend of folklore. There was this great city of wide shoulders in the middle of the country, but of course it’s patently false. Or it was, anyway. I would come and visit quote-unquote Chicago for meetings and public appearances and lectures and comedy and so forth, and it was really amazing the lengths to which the so-called Chicagoans would go to maintain this fantasy. They’d build a great papier-mache city, a great white city* just to fool me and themselves that it was Chicago. I’m pretty sure as soon as I left the rain would wash it all away back into the lake. And now there is a real city called Chicago. It happened. It materialized, like magically. I’m looking forward to coming back to it. C: And when did that happen? 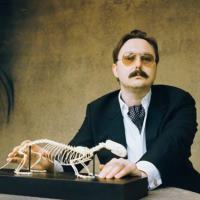 JOHN HODGMAN: I would have to go back through my notes. Sometime in the fall of 2012…. In all seriousness, I love Chicago whether or not it was ever real. I’m glad now that for sure that it exists, because I love it so much. 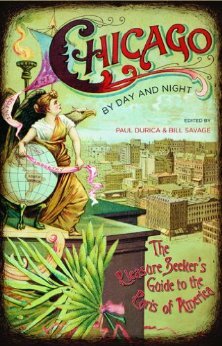 Paul Durica and Bill Savage, two Chicago writers, have published a new edition of Chicago by Day and Night: The Pleasure Seeker’s Guide to the Paris of America. They recently did a joint reading of excerpts from the book at the Newberry Library. Savage teaches Chicago literature, history and culture at Northwestern University and the Newberry. Durica is a writer and the founder of Pocket Guide to Hell Tours and Reenactments. The book was originally published in 1892 for visitors attending the World’s Columbian Exposition of 1893. It advises such “wayfarers” where to find dining, amenities and proper entertainment while avoiding “the free and easy shows, gambling hells, barrel-house saloons, massage parlors and other dens of iniquity that beset our great city.” In so doing, of course, it makes the dens of iniquity seem very alluring. The two writers wrote a new introduction and extensive notes for this edition. They tried to “strike a balance between recreating the book as it originally appeared and making it modern.” The entire book was reset in type, but the authors retained elements of the design, including the cover and most of the illustrations. The original book was meant to be vest pocket size. It’s 7×4.5 inches. Without the introduction and 65 pages of notes, it might still fit in a vest pocket. The book was just published by Northwestern University Press; cover price is $16.95. While perhaps not a good reference for today’s tourist, it’s funny and engaging with many delectable quotes for a lover of Chicago history and trivia. * “… a great papier-mache city, a great white city”: This might be a reference to the World’s Columbian Exposition of 1893, built on Chicago’s south lakefront and known as the White City. All but two of the buildings were meant to be temporary and were demolished after the fair. The Beaux Arts structures were built of “a mixture of plaster, cement and jute fiber called staff.” Erik Larson’s book, Devil in the White City, gives many details of the fair’s construction. ** “Chicago is a pocket edition of hell.” “Hell is a pocket edition of Chicago.” According to legend (located in a footnote in Jack London’s 1907 novel The Iron Heel), a famous English labor leader named John Burns visited Chicago. When asked his opinion of the city, he said, “Chicago is a pocket edition of hell.” Later, as he departed for England, he was asked if he had changed his opinion of Chicago. “Yes, I have. My present opinion is that hell is a pocket edition of Chicago.” Thanks to Chicago Weekly; see more here.